The 2013 Allianz Leagues Predictions competitions are about to start. This year by entering your predictions on www.allianzleaguespredictions.ie you could win up to €5,000 for a nominated GAA Club and up to €4,100 for yourself! Competitions close after all Allianz Leagues 2013 trophies have been presented to the winning counties. The Allianz Leagues throw in on Saturday the 2nd of February! 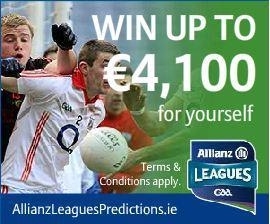 Login to your account on www.allianzleaguespredictions.ie now to start setting your predictions for week 1 fixtures. Remember you can set up and join Mini Leagues, so you can compete with colleagues or friends, or you can even set up a fundraiser for members of your club! AllianzLeaguesPredictions.ie does all the hard work - All you have to do is collect the money from those who entered your mini league and decide on the prize for your mini league. The Allianz Leagues throw in on Saturday the 2nd of February with Kildare entertaining Donegal in Croke Park. We want you to enjoy the action and test your GAA knowledge and maybe raise some vital funds for your nominated club all at the same time! It's simple! All you have to do is predict the winning team and margin of victory (or select a draw) for all the fixtures every weekend in the Allianz Leagues in the Football and/or Hurling competitions. The better you are at predicting the draw/winners correctly and the closer you get to the margin of victory the more points you earn. See competition rules. See Terms and Conditions. Set up a Mini League? In addition, once registered, you are able to set up and join Mini Leagues, so you can compete with colleagues or friends, or you can even set up a fundraiser for members of your club! The entrant with the most points in the Football competition at the end of the Allianz Leagues will win €500 for themselves and €2,500 for their nominated Club. Likewise the entrant with the most points in the Hurling competition at the end of the Allianz Leagues will win €500 for themselves and €2,500 for their nominated Club.